ABOARD THE PAPAL FLIGHT FROM DUBLIN (CNS) — Pope Francis said Archbishop Carlo Maria Vigano’s long document calling on him to resign is written in a way that people should be able to draw their own conclusions. Asked directly when he first learned of the former Cardinal McCarrick’s sexual abuse, Pope Francis said the question was related directly to Archbishop Vigano’s report and he would not comment now. Archbishop Vigano, the former nuncio to the United States, claimed he told Pope Francis about Cardinal McCarrick in 2013. In June, the Vatican announced that the pope had ordered the former Washington archbishop to live in “prayer and penance” while a canonical process proceeds against him. The pope later accepted Archbishop McCarrick’s resignation from the College of Cardinals. The issue of clerical sexual abuse and other crimes and mistreatment of minors and vulnerable adults by Catholic priests and religious and the attempts by bishops and superiors to cover up the facts dominated the news coverage of the pope’s trip to Ireland for the World Meeting of Families. Marie Collins, a survivor and former member of the Pontifical Commission for the Protection of Minors, told reporters after the meeting that she is still concerned that the pope has not established a tribunal to investigate and hold accountable bishops accused of failing to protect minors and covering up abuse. Pope Francis said while he likes and admires Collins, “she is fixated” on the accountability tribunal, and he believes he has found a more efficient and flexible way to investigate and try suspected bishops by setting up temporary tribunals when needed. Pope Francis said the archbishop has appealed the conviction and, while he has asked some canon lawyers for input, he plans to make the final judgment on the archbishop’s case himself. But the archbishop was accused of sexually abusing minors; the tribunal Collins was talking about was supposed to look specifically at bishops accused of covering up cases of abuse. The pope immediately welcomed one of the suggestions made during the meeting with survivors: that he ask publicly and very specifically for forgiveness for the abuse that took place in a variety of Catholic institutions. The result was a penitential litany at the beginning of the Mass he celebrated in Dublin Aug. 26 to close the World Meeting of the Families. Pope Francis said the survivors’ meeting was the first time he had heard details about the church-run homes for women who were pregnant out of wedlock. Many of the women were forced to give their babies up for adoption and were even told that it would be a “mortal sin” to go looking for their children. The now-notorious St. Mary’s home for unmarried mothers and their children in Tuam was a specific case brought to the pope’s attention personally by Katherine Zappone, Irish minister for children and youth affairs. In May 2014 a local amateur historian in Tuam claimed that between 1925 and 1961, 796 infants died in St. Mary’s home. She found burial records only for two of the children. The rest, she believed, were buried in a common grave on the site, including in a former septic tank. The home was run by the Bon Secours congregation of nuns. The Irish government is still in the process of trying to determine the best way to remember the victims and decide what to do with the Tuam site. Asked by reporters what lay Catholics can do about the clerical abuse scandal, Pope Francis responded, “When you see something, say something immediately,” preferably to someone with the authority to investigate and stop it. 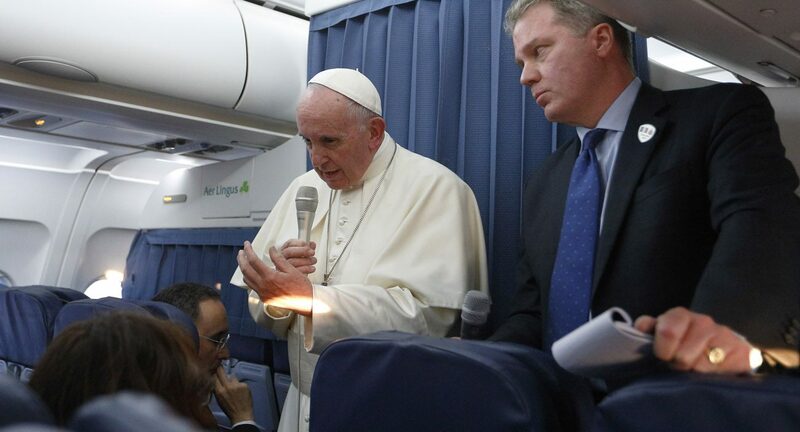 During the inflight news conference, Pope Francis also was asked about Ireland’s legalization of gay marriage and what advice he would give the parent of a gay child. “What would I say to a parent whose son or daughter had that tendency? I would say first, pray. Don’t condemn. Dialogue, understand, make room for that son or daughter, make room so he can express himself,” the pope said.